New York, NY (March 28, 2019)– Cadence13, a leading premium podcast company, today announced the second season of the critically acclaimed Crimetown Presents series, Crimetown Presents: The Ballad of Billy Balls. Edited and produced by Marc Smerling and Zac Stuart-Pontier—the Emmy and Peabody award-winning co-creators of Crimetown Presents: The RFK Tapes, The Jinx: The Life and Deaths of Robert Durst and Crimetown—Crimetown Presents: The Ballad of Billy Balls will be hosted by activist and writer iO Tillett Wright. ADT will be the presenting sponsor of the entire season. Downtown New York, early summer, 1982. A man bursts into an East Village storefront apartment and shoots musician Billy Balls. The motive? Unknown. Billy’s body? It just disappears. Rebecca, Billy’s girlfriend, doesn’t know what to do and has no way to say goodbye. Now, thirty-seven years later, iO Tillett Wright helps give Rebecca the opportunity to let go. In Crimetown Presents: The Ballad of Billy Balls, Wright goes searching for answers and unravels a mystery of love and loss, the tender binds of family, and the stories we learn to tell ourselves just to survive. Crimetown Presents: The Ballad of Billy Balls launches on March 28, 2019 with Episodes One and Two on Apple Podcasts and wherever podcasts are available. Listen to the trailer, first two episodes, and subscribe to the series here: https://itunes.apple.com/us/podcast/the-ballad-of-billy-balls/id1391405921?mt=2. In the late 1970s, Rebecca Wright was an actress pounding the streets of New York. In 1977, she met a musician named Billy Balls, and they fell deeply in love. For seven years, the two of them made love, music and art together in the East Village, until one day in the summer of 1982, Rebecca came home to find her windows blown out and Billy gone. Shot seven times without explanation, his body sat for ten days in Cabrini Hospital and then was mysteriously taken to an anonymous burial ground that she cannot find to this day. For thirty-four years, Rebecca has lived as a widow and to this day, has never said goodbye. Why was Billy disappeared? Was this a cover up? Who killed Billy Balls, and why? iO Tillett Wright is an activist and writer and the author of the memoir Darling Days. Growing up in New York City, Wright had an unorthodox upbringing where individuality and being different was actually the norm. Wright uses these experiences to inspire his photography, which centers on the differences and similarities between straight, gay and lesbian people. He explores the confusion of gender and defies the natural human tendency to categorize people into groups, even when they exist somewhere between. Wright's photography is regularly featured in the New York Times. He has published three limited edition books of photographs: Lose My Number, KISSER, and Look Ma', No Hands. Download the cover for Crimetown Presents: The Ballad of Billy Balls here: https://we.tl/t-muvL4CwJQE. 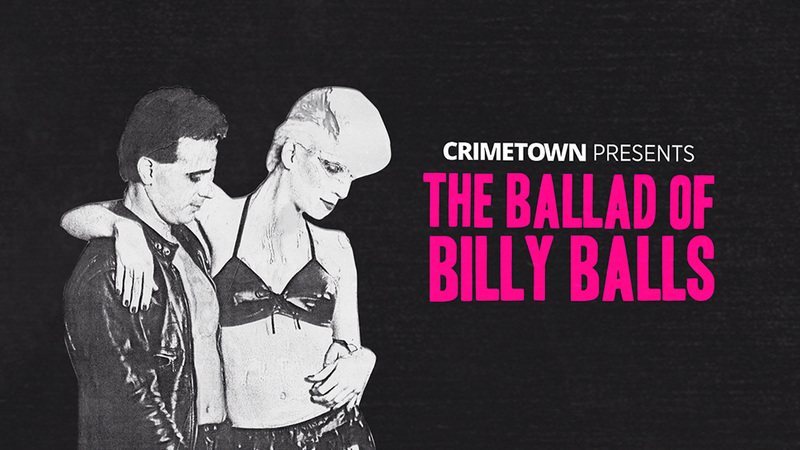 Embed code for the Crimetown Presents: The Ballad of Billy Balls trailer: <iframe src="https://shows.cadence13.com/player/the-rfk-tapes?customColor=%23120f45" style="height:200px; width:100%; border: 0 none;" scrolling="no"></iframe>. Cadence13 is a leading premium podcast company and was named one of Fast Company’s “World’s Most Innovative Companies for 2019.” Our roster of critically-acclaimed shows and personalities reflects the diverse conversations and interests happening in the world, led by a collection of voices that include Sophia Amoruso, Nick Bilton, Rachel Brathen, Kobe Bryant, Deepak Chopra, Gotham Chopra, Lauren Conrad, Remi Cruz, David Dobrik, Jon Favreau, Malcolm Gladwell, Andrew Jenks, Peter King, Tony Kornheiser, Michael Lewis, Payne Lindsey, Jon Lovett, Alisha Marie, CJ McCollum, James Andrew Miller, Jim Norton, Gwyneth Paltrow, Josh Peck, Zac Stuart-Pontier, Paul Rabil, Rhett and Link, Rick Rubin, Michael Sheehan, Maria Shriver, Marc Smerling, Tommy Vietor, iO Tillett Wright, Adrian Wojnarowski and many more. These storytellers represent both established and emerging personalities across sports, business, tech, politics, entertainment and news. Cadence13 has a broad range of programming partners including Comments by Celebs, Conde Nast, Crooked Media, Entertainment Weekly, Girlboss Media, goop, Granity Studios, Meredith, Mythical Entertainment, Pushkin Industries, Ramble, Seven Bucks Productions, Sports Illustrated, Tenderfoot TV, theSkimm, TNT, UFC, Up and Vanished, UTA, Vanity Fair, Who? Weekly and Yoga Girl, among others. Cadence13 is headquartered in New York, with offices in Los Angeles and San Francisco.